Take your can cooler with you. It's portable and collapsible. Great for mailing. Minimum quantity with your imprint, 200. Quantity variation +/- 5% is possible and billable. Two or more colors require a heat transfer. 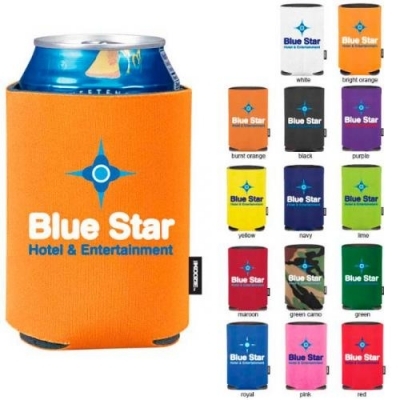 Add $0.35 per color per location, plus heat transfer setup $50 per side. Maximum 4 imprint colors per side. Setup: $50 per side, for optional multi-color imprint.